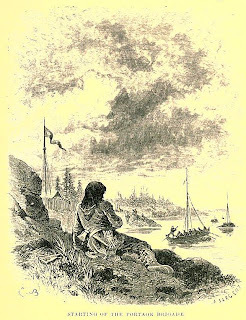 The Portage La Loche Brigade leaving Norway House between 1841-1847. The man watching is dressed as a member of a brigade. Men from the Red River Settlement recruited by the Hudson's Bay Company formed the first Portage La Loche Brigade of 1826. 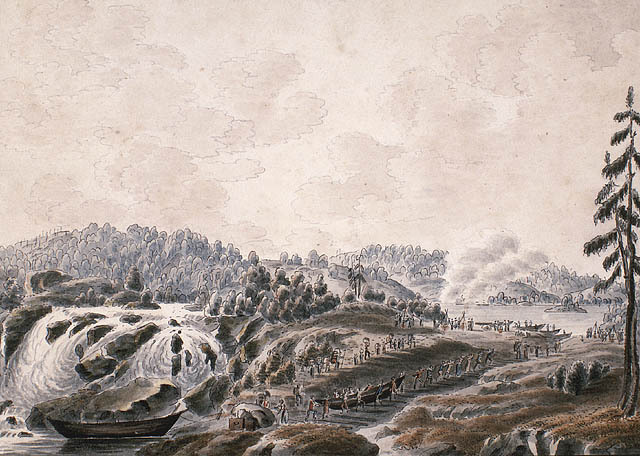 The brigade consisted of 7 York boats with Laurent Cadotte as guide. 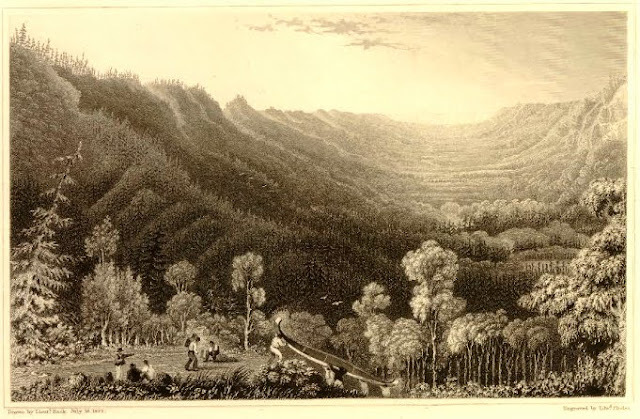 The guide in 1833 was Alexis L'Esperance (he retired in 1866). In 1848 two Portage La Loche Brigades were formed. Each brigade had seven boats, each with a guide. One brigade was still guided by Alexis L'Esperance (*Alexis Bonami Lesperance), the other by Jean Baptiste Bruce. In 1866 the HBC increased the Portage La Loche Brigades to three with seventeen boats in total. The last Portage La Loche Brigade arrived at Norway House in the early 1870's. Many of the men of the Portage La Loche Brigades of 1862 took part in the Red River Rebellion of 1869.
were French Canadian Metis from the Red River Settlement. Many of these men also had close family ties to residents of the North-West. The trip from the Red River Settlement to Portage La Loche would begin around the 1st of June and end around the 8th of October. This famous brigade traveled 4000 miles every year. The following are estimates of the times and dates when the brigades arrived and left each section of their route. From the "History of La Loche"
This photo of Lac La Loche was taken on May 1, 2010. It will take another week or two for the ice to break up on the lake. Across the lake behind the island is the entrance to the portage. This is the only island on the lake. "Vale of the Clearwater River from the Methye Portage"
A 1828 etching by Edward Finden (from the British Museum) based on Sir George Back's 1825 watercolor. York boats being portaged painted by a 15 year old Peter Rindisbacher in 1821. 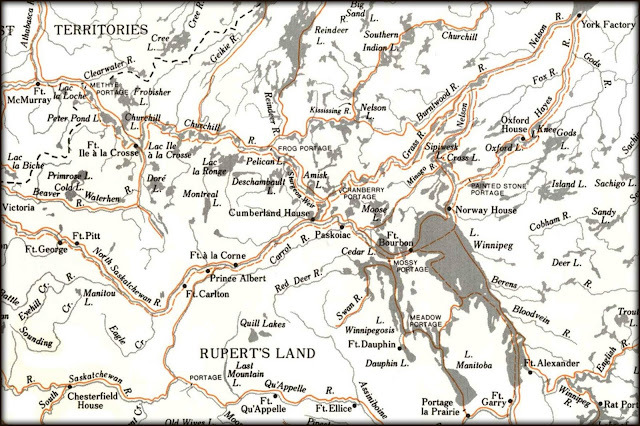 This portage would be located between York factory and Norway House. 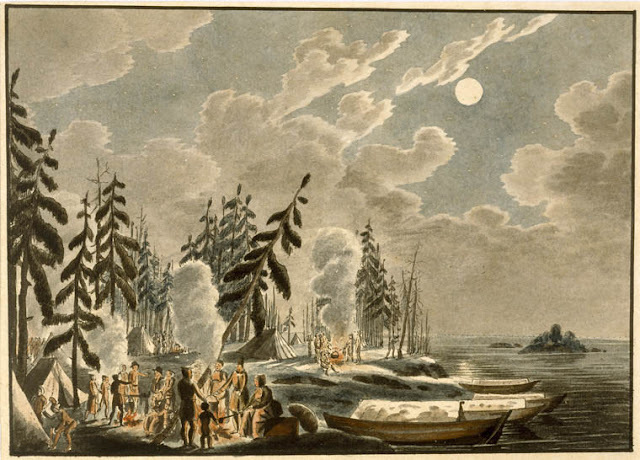 This painting by Rindisbacher in 1821 shows York boats and a camp on the shore of Lake Winnipeg. 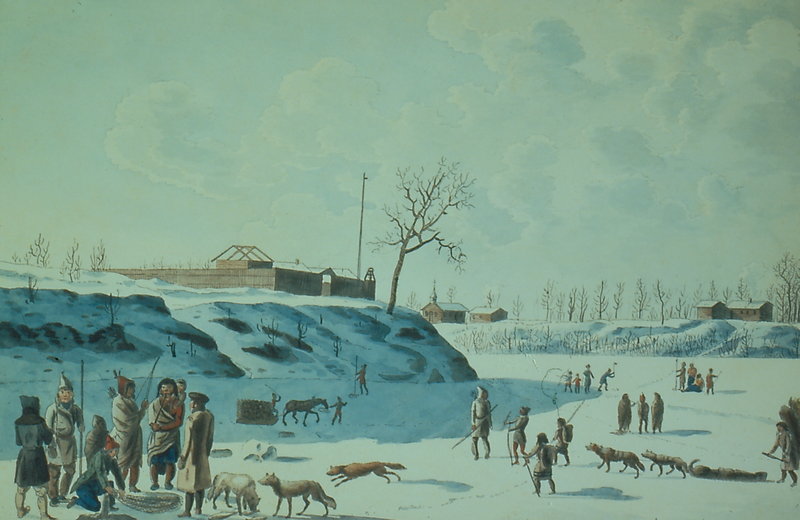 Ice fishing on the Red River by Rindisbacher painted in the early 1820's. The location is now Winnipeg with Saint Boniface across the river.